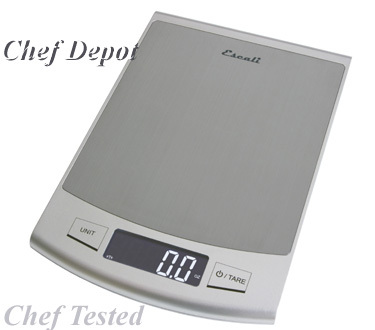 These Kitchen Timers combine style with function, we have test them all, these models are high quality. These timers are very cool looking and they are accurate! They make perfect gifts too! 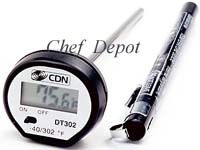 Chefs Note: This one is best quality timer, cheaper copies are sold by the big A sites. Keeping a baby Chef in the kitchen is very cool. Your guests will notice him and smile. 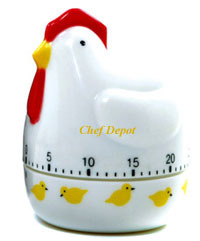 This is a Chicken kitchen timer! It is set by turning the bird to the desired number of minutes. It has a range of 1 to 60 minutes. Chefs Note: Retro and Chic. Your guests will notice him and smile. Christmas is coming! 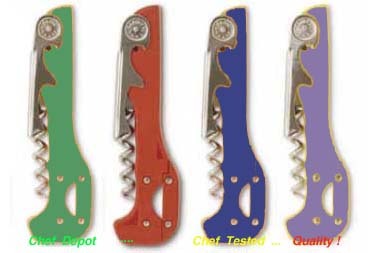 Our Pro Chef knives make Perfect Gifts! 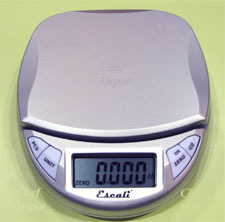 Chefs Note: Stainless steel construction, it features a very loud ring that goes for 9 seconds, made to last. This is our new "UFO Timer". It easily wids up from 1 to 60 minutes. Stainless steel construction, it's made to last. Chefs Note: Toss it up in the air at your next party. If you have a good camera, you could become famous. This is the best quality mechanical timer for the price. It has a wind up face that works from 1 to 60 minutes. 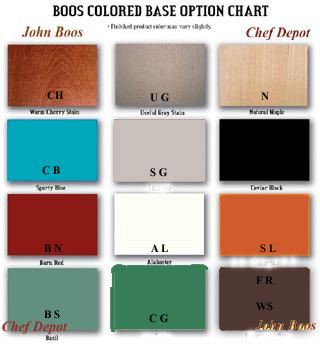 Click Here for Chef Tongs & High Heat Colored Spatulas! 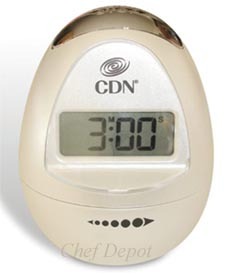 Chefs Note: This timer includes a long life battery that outlasts the competition. 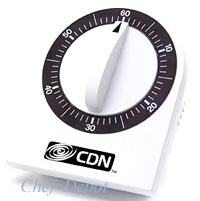 We recommend this timer for kitchen and home use as well as sporting events! 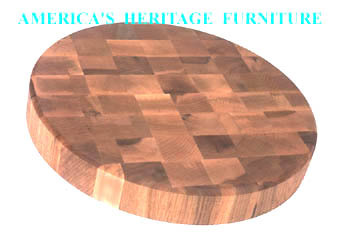 Meat Grinders & Butcher Blocks! 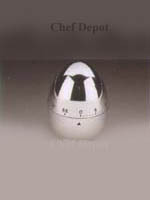 Our Chrome Egg Timers are a functional work of art. These easily wind up from 1 to 60 minutes. Exactly the size of a jumbo chicken egg. Choose a chrome egg to capture the reflection of everything in your kitchen. 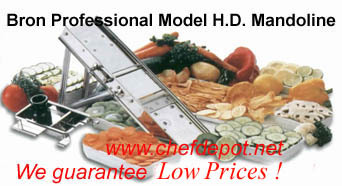 Chefs Note: High quality, what more do you need? Christmas is coming! These Timers make Perfect Gifts! 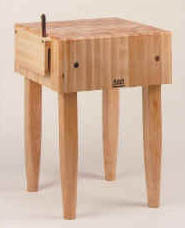 Our mechanical timers feature easy to turn knobs, loud and long rings and a sloped design for best viewing. These Mechanical Timers are designed to sit on a countertop or hang on a wall. Loud 3 second ring. This is a new Kasumi Titanium Filet & Carving Knife, with a 7 3/4 in. blade, it's the sharpest and slickest blade made. 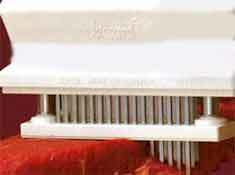 The edge that is holds is hair splitting and remains throughout heavy use. 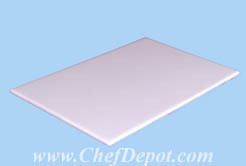 The non slip poly handle is very comfortable and virtually indestructible, perfect for every serious Chef. We could not believe how sharp these knives were until we tried each one. It simply glides through most any food. The outstanding Kasumi Titanium coated blade has been achieved by combining the best of advanced modern manufacturing. 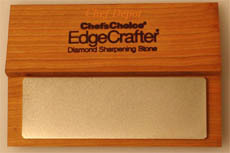 Keeps a sharper edge longer than other knives. 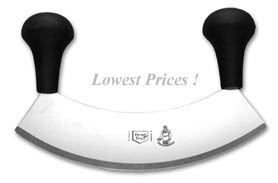 More Mezzaluna Ulu knives! Low Prices! Quantity Discounts, Please Call Us!